Thank you for visiting my website. 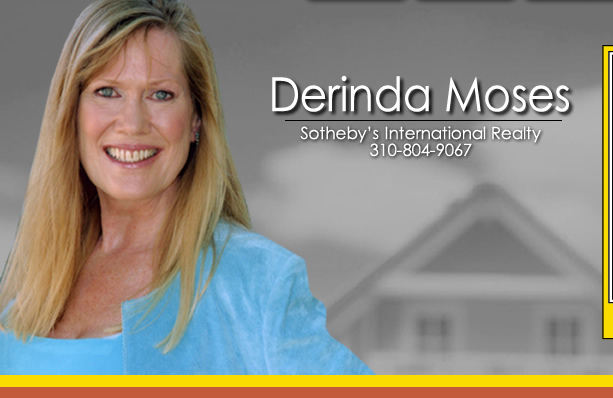 Please look around and let me know how I can help you with your Malibu or Topanga area real estate needs. I strive to provide the very best service available anywhere, and I am always eager to take up new challenges, no matter how big or small. I am a Certified Distressed Property Expert and would be happy to answer any questions you have. I am here to help you. Properties for Sale: homes for sale throughout Southern California are posted here. I hope you will take time to review the featured homes, conduct a custom search, and sign up for an email home search program. Market News: the Market Trends newsletter is available each month and updated with national and local real estate information. About Derinda Moses: This is all about me. You will also find additional contact information here. If you have any questions about this site, or questions about real estate in Malibu and the surrounding areas in general, please contact me today and let me know how we can be of service! Thank you for visiting!